Merely a year and a half after the success of “Mekong Delta”, director Dante Lam returns for a second over-the-top helping of bombastic action based on real-life events. Concerning the 2015 evacuation of nearly six hundred Chinese citizens from Yemen’s southern port of Aden during the Yemeni Civil War, this new effort from the celebrated filmmaker trades on the same set of tactics created for other Jingoistic military movies to follow the soldiers in their mission. 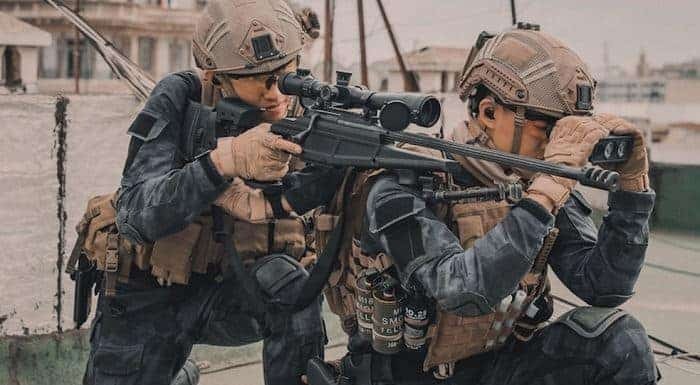 Fearing a major coup against their citizens, the Chinese Navy orders the members of the Jiaolong Assault Team, stationed near the coast of Morocco where the citizens are located, into action. Arriving in the middle of a massive firefight between the local forces and various rebel troops, the squad eventually gets word that the entire coup being planned is merely a ploy by the rebels in order to access a special material for use in making dirty bombs. Forced to push forward with no other alternative possible, the group manages to put their skills to the test in order to complete the mission and stop the terrorists from successfully acquiring the deadly materials. ‘Operation Red Sea’ emerges as quite the fun film on various fronts. When dealing with issues solely as a bullet-flying, explosion-happy action film, this delivers in spades. The action quotient present here is incredibly thick and fast and is filled with adrenaline-charged set-pieces, from the opening commando operation against the rebels on board the ship full of hostages or the stellar series of maneuvers showing the group entering enemy lines to rescue the civilians being held hostage. These scenes showcase director Lam’s action choreography as well as Faycal Attougui and Jarno Cordia’s stunt coordination rather well with a mix of close-quarter combat and long-range gunfighting. Maintaining a fast, frenetic pace during these scenes, they set the stage for the main section of the film which is the ambush on the terrorists’ village that takes up nearly the final hour of the film. Filled with numerous instances of military-styled gunplay, plenty of bullets riddling bodies and throwing in some car chases and a tank battle during a roving sandstorm for good measure, there are numerous moments within this section of ‘Operation Red Sea’ makes for plenty of explosive fun and thrills with the grandiose combat tactics and strategies utilized. This part of the film delivers in fine form and has plenty to like about it. What really gives these scenes their power is Lam’s story, placing plenty of importance and prominence on moving the action forward. The setup here, of requiring the squad to get involved in the action early on and generate several lengthy and brutal confrontations with the rebel groups in various locations, offers that kind of simple storyline. With the basic functions serving only to put them into danger charging after the various terrorist members to rescue their hostages or to prevent the shipment from reaching their campsite, the movie doesn’t offer much more than an opportunity for those various fights and chases to occur in order for the squad to make it to safety. With their tactics relying on military practices and other expected procedures without any kind of twist, it plays rather finely in that manner where it’s this series of minor operations within their larger mission. Therefore, the film remains interesting with the straightforward manner of storytelling that keeps ‘Operation Red Sea’ running along without fail. Coupled with the stellar gore provided by Matthew Smith which shines for their realism and brutality, these here help to make the film work nicely. Still, even with these positives, several minor aspects of ‘Operation Red Sea’ really hold it down. The movie is way too long for its own good. Although incredibly fun to watch, the grandiose nature of the action scenes causes the length of the film to spread itself out longer than necessary. Watching the bullet-time travel on several occasions, from the exit from the barrel to the travel it takes over long distances, all the way to where it strikes the intended target, are endless as this features their journey from a great distance all the way to the point of impact. Not only could these scenes be trimmed down or removed altogether, they derail the momentum of the sequence and eat up the running time by going overboard with this tactic that’s not important. The other minor factor is a series of rather obvious and unimpressive CGI led by supervisor Kosta Lagis, that is far from the more realistic stuntwork prepared earlier, which stand-out for the obviousness of the tactic and the places chosen for its execution. Other than these minor issues, there’s not much else to be said about the film. 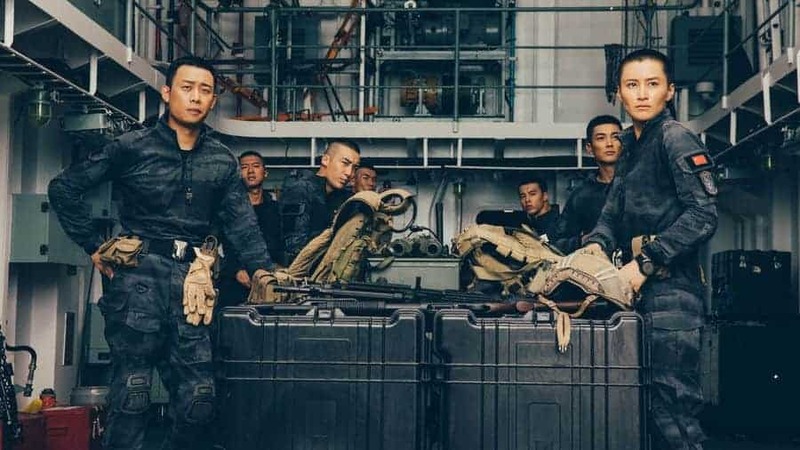 While not as flawless as some of its counterparts in this recent trend of military-heavy action films emerging, those that do show up are nowhere near as prominent as the positives which make ‘Operation Red Sea’ really enjoyable. Give this a shot if you’re into the previous entries in this style, a fan of the creative parties involved or looking for plenty of adrenaline-charged action in your films, while those that don’t appreciate those terms should avoid altogether.